The next week and a half (or so) should prove to be some of the beeriest few days the Pikes Peak region has seen in a while. Up in Monument, Pikes Peak Brewing is launching the third annual Monument Beer Week, and they are hosting one great looking event every day of the week. Meanwhile in Colorado Springs we’ll see a few really good looking tapping events, including a special beer release from our old hometown hero Black Fox Brewing! Check out the full list and details below. If it’s green, it’s Monument Beer Week, if it’s orange it’s in Colorado Springs. Monument Beer Week events happen at Pikes Peak Brewing, 1756 Lake Woodmoor Dr Monument, CO.
At Brewer’s Republic / 112 N. Nevada St.
Dry Dock is distributing to Colorado Springs now! To celebrate they’ve got a tap takeover at Brewer’s Republic. The beers are: Apricot Blonde, Hop Abomination, Hefeweizen, Trippel, Amber, Frolic English Pale, and Vanilla Pale. Quite the takeover! We’ve also seen on Black Fox Brewing’s FB page that they’ll release their “Cracked” Saison during the Dry Dock tapping. Black Fox brewer, John Schneider, now works for Dry Dock and says the beer will have a Dry Dock tap handle but is the old Black Fox recipe, so check it out. Trinity Brewing / 1466 Garden of the Gods Rd. Le Capitaine, Petite Bouddha. A Blonde Saison Regal brewed as the tipping of the hat to Peter Bouckaert. Brewed with an absurd amount of pumpkin, candied endive, cacao nibs, and Buddha’s hand, then fermented with various strains of Bretta, Lacto, and Saison yeast. The resulting beer has a light body and very softly spoken complexities. Extremely drinkable for a very large Super Saison. 10.4% ABV. Don your kilt and head over to PPBC for an afternoon of Irish food, special Irish beers, and Irish Folk Rock from the Indulgers 4-7pm! Presided over by Official PPBC Leprechaun of 2013, Erin O’Connors. Incline Imperial IPA aged in Templeton Rye barrels, Red Wine Barrel Aged Gold Rush with Brett, and Rum Barrel Aged Porter. Pikes Peak will also be hosting the Tucson Pipe and Drum Corps to celebrate the release of the 4-pack cans Local 5 Pale Ale. The proceeds from which will benefit the Colorado Springs Local 5 and their efforts to support the families of fallen firefighters across the country. 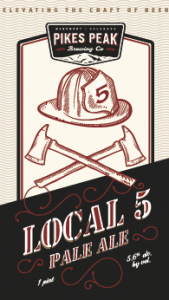 Local 5 has Mosaic hops and should be available around the region in liquor stores. Details will be available on the PPBC Facebook page as the date gets closer. Trinity Brewing, 1466 Garden of the Gods Rd. Trinity’s newest harvest focused recipe, the Houdini Hopper is a wet hop ale with 100% Simcoe hops. Crafted in honor of brewer Tom Brown’s late and loved dog. The malt body of this beer has the structure of an IPA, with light toast and carmel notes to support the hops in this beer. Very drinkable and never grassy, this beer quickly became a favorite seasonal. 6.4% ABV. 2PM / Pikes Peak Brewing Oktoberfest! 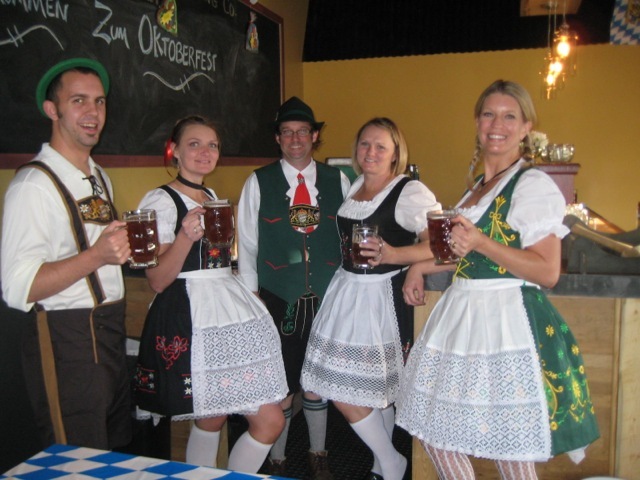 PPBC has a wonderful Oktoberfest planned to celebrate beer, food, games, and, well… beer! Tickets are available online here, and include a coupon for $1 off a PPBC beer. Things will kick off at 2pm at Fox Run Park for a traditional Volksmarch! Back at the taproom, from 5-7pm there will be serving a traditional Oktoberfest meal with a souvenir stein of the beer of your choice. From 6-9pm The Button Boyz will bring their oompah best for the full Oktoberfest experience! Seats are limited for the Oktoberfest dinner, so please reserve your spot now! $32, reserve your spot here. A full day Oktoberfest party at Great Storm Brewing. The brewery will tap Red Oktober, a mashup of Irish and German style beers with a Russian name, Ralphie’s Red Rye and other great beers. German food will be available from 4-7pm by Manna Mobile and live music by BJ Estares from 7-9pm. Should be a fun night! Details are available here, check out the great looking menu and the specialty beers that Breck is providing. You can call and reserve tickets at 719.633.2105. Announcing: Beers Made By Walking – October 8th in Denver!